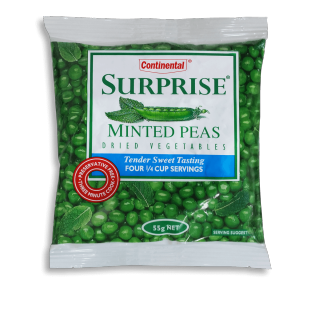 Surprise Minted Peas taste just like fresh garden peas because they are specially selected, picked fresh when they are in season and quickly dried to seal in all the goodness. With no preservatives, and ready in just a few minutes, Surprise Minted Peas are the perfect healthy and delicious side for any meal. Keep a couple of packets in your pantry so they are ready when you are. My family and I are so disappointed we can no longer purchase thIs product from our local Supermarket. We Live in an isolated town with only woolworths and IGA - why was the product discontinued? It wasn’t due to poor sales as was often sold out! Sorry Jules, yes this product was deleted due to poor sales & low distribution. We'll share your comments with the team. Is there any way we can import these peas into Perth from NZ ?? Sorry, we don't have any plans to bring this to Australia but we'll pass your request along to the team. Why have these been discontinued in australia? At least put them in Iga stores. Sorry, but products are often deleted due to poor sales. We'll pass your comments along to the team. Hi, you should still find your favourite minted peas in Countdown stores. These are convenient and taste great but they have dissapeared off the shelves in australia. What happenned and when will they be available again? Hi, sorry to hear that this deletion has caused such sadness. It wasn't as popular as it is in New Zealand. Surprise peas are wonder and full of flavour, but Woolworths and coles have stopped supplying them, where can i buy them? Sorry to disappoint you Jamie but our Minted Peas are currently only available in New Zealand.